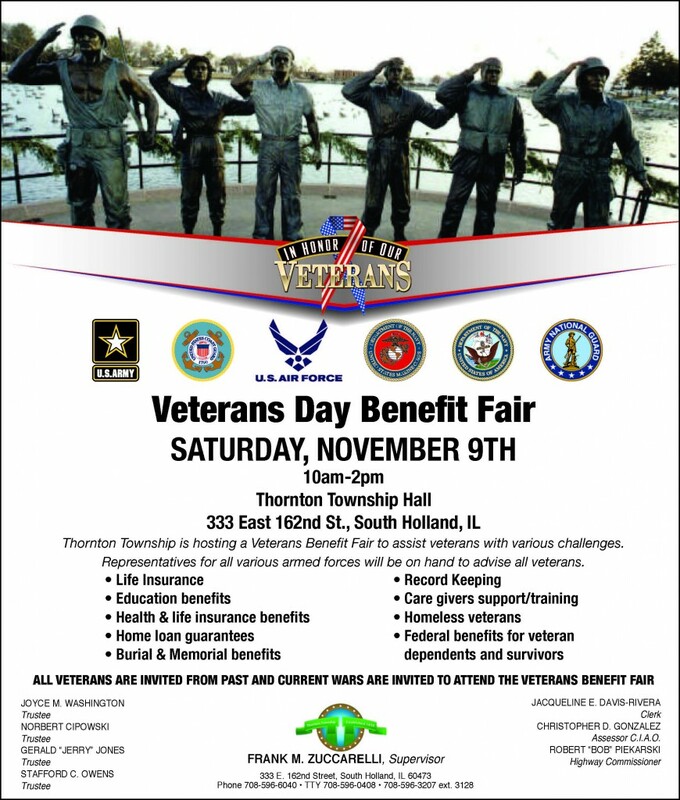 Township dollars may be available for you! 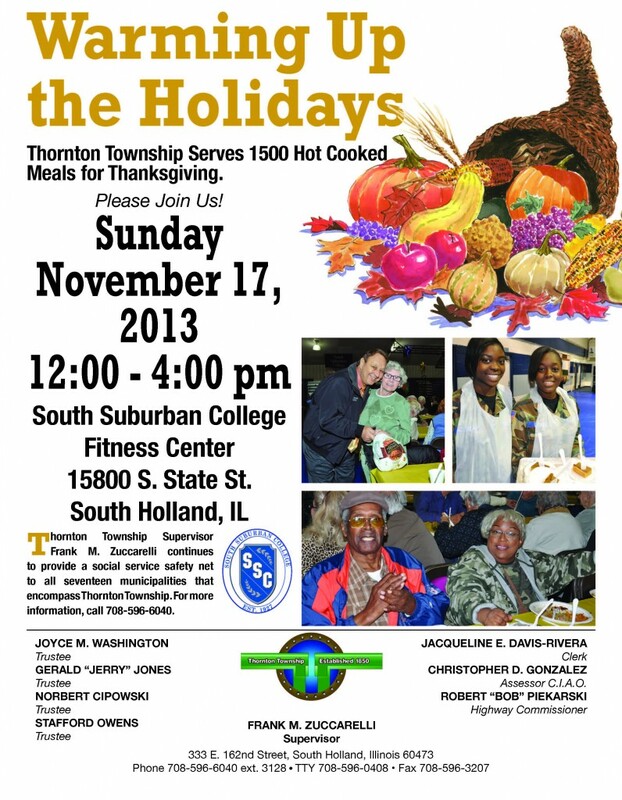 Thornton Township residents only. Documentation Required. Seventeen municipalities that encompass Thornton Township have a record number of gas shutoffs due to last year’s harsh winter season 2012. 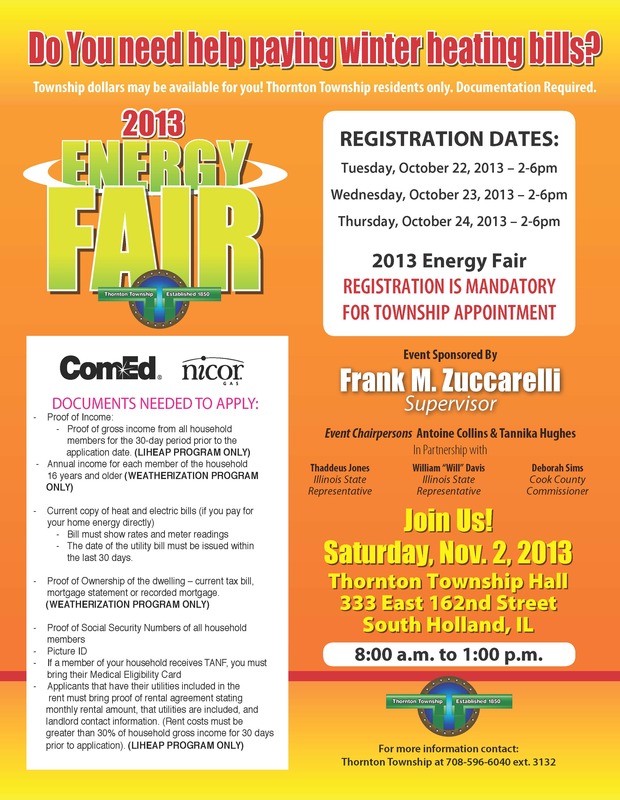 On Saturday November 2, 2013, Thornton Township located at 333 East 162nd Street South Holland, Illinois will host its 2013 Energy Fair from 8am – 1pm. Thornton Township will coordinate this Energy Fair in conjunction with Nicor Gas, ComEd, and CEDA to assist as many residents with Township dollars in paying energy bills as long as the money is available. 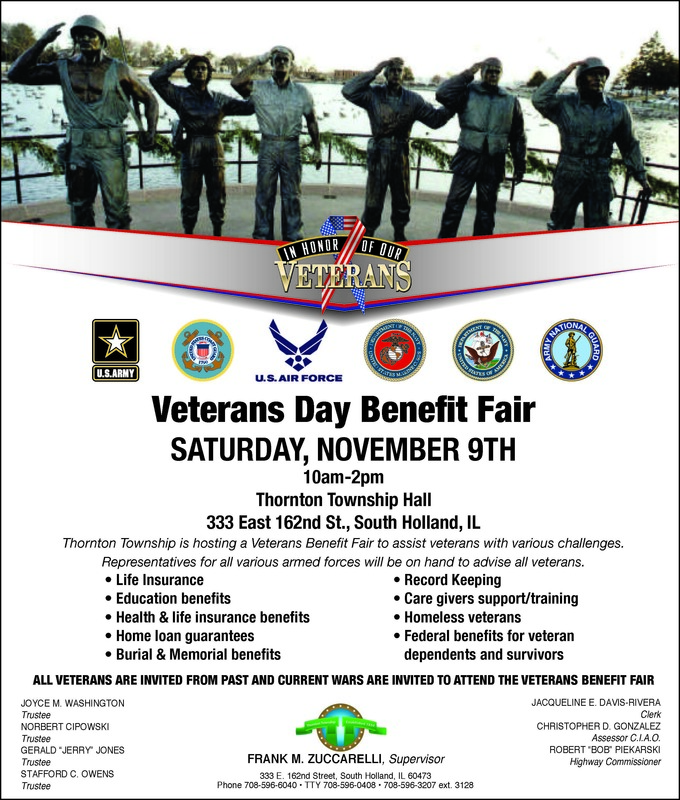 Thornton Township residents must qualify for these funds. For those who are on the verge of disconnection Thornton Township will negotiate with Nicor Gas, ComEd and CEDA for payment and put customers on a payment plan. Proof of gross income from all household members for 30 day period prior to the application date (LIHEAP PROGRAM ONLY), annual income for each member of 16 years and older (WEATHERIZATION PROGRAM ONLY), current copy of heat and electric bills which must have been issued within the last 30 days, proof of ownership of dwelling, (lease, rent receipt) social security numbers of household members and a picture ID. Thornton Township is negotiating with Nicor and ComEd to allow services to be connected again. For those who are on the verge of disconnection we will negotiate with Nicor and ComEd to get on payment plan so services are not disconnected. The 2013 Energy Fair is sponsored by Thornton Township Supervisor Frank M. Zuccarelli, Antoine Collins & Tannika Huges, Event Chairpersons, CEDA, Nicor Gas, ComEd, in partnership with Illinois State Representative Thaddeus Jones, Illinois State Representative William “Will” Davis, Cook County Commissioner Deborah Sims and Cook County Board Commissioner Joan Murphy. 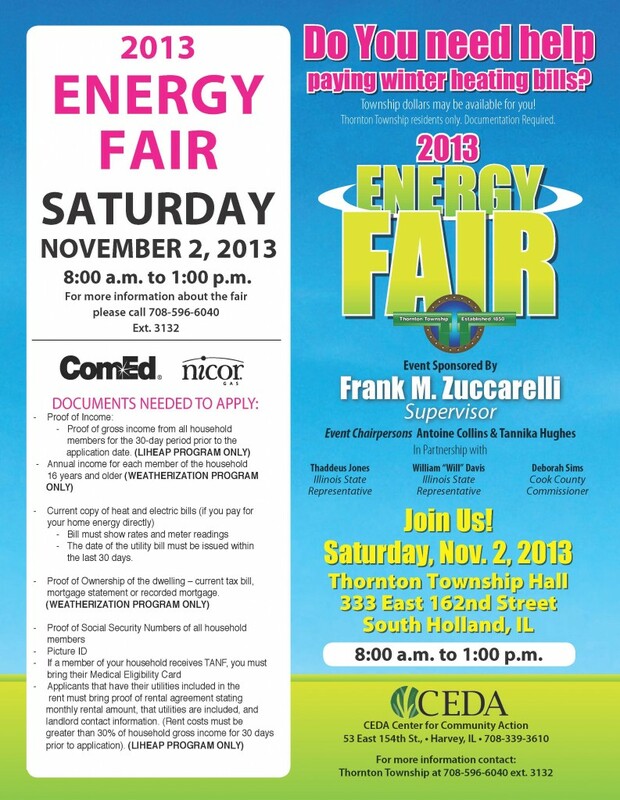 For additional information about the energy fair please call 708-596-6040 ext. 3132. 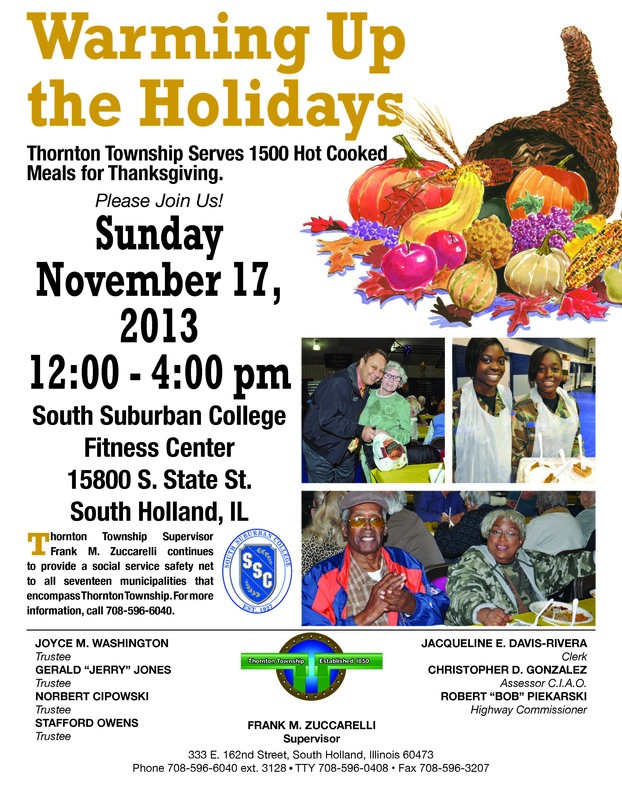 Thornton Township is a social service safety net for all seventeen municipalities.